NEW YORK - Energy Northwest in Washington State will price $635 million of electric revenue refunding bonds on May 9, the largest deal in next week's estimated $7.2 billion of U.S. municipal bond and note sales. The deal includes $230.7 million of tax-exempt bonds for the agency's Columbia Generating Station and $400 million for "Project 3" and about $5 million of taxable bonds. The bonds are supported by net billing agreements with the Bonneville Power Administration (BPA), a regional power marketing agency within the federal energy department. BPA is facing headwinds in the wholesale power market, where prices have been depressed in recent years by low natural gas prices as energy firms pull record amounts of the fuel from shale formations. From 2013 to 2017, average prices at the Mid Columbia hub near the Oregon-Washington border have averaged $30.27 per MWh, compared to $44.33 over the prior 10 years. Those headwinds, as well as implementation of policies that favor customers, have led to "an erosion of financial strength that weakens BPA's position in its rating," Moody's Investors Service said on Tuesday when it rated the deal Aa1. BPA's recent strategic plan laid out objectives that could help its credit rating, including a goal of reducing its debt ratio and maintaining a $1.5 billion line of credit from the U.S. Treasury. But the goals may not be enough to stop its credit deterioration if they fail to "translate into robust actions," Moody's said. "The extent of any credit benefits of BPA's new strategic goals should become evident by the end of this year when BPA files its initial proposal for the FY2020-2021 rate case," Moody's said. 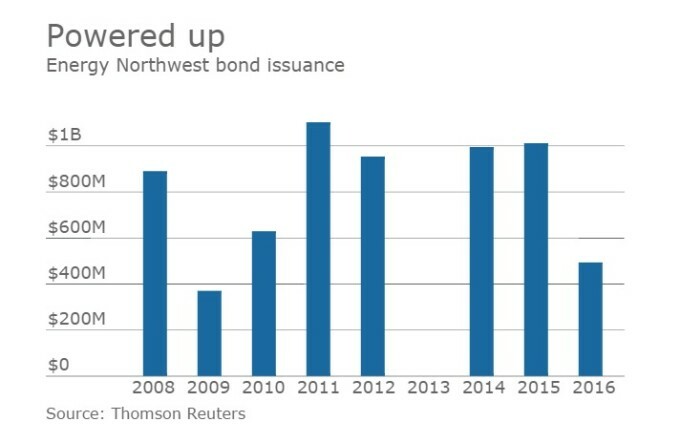 Under a regional cooperation debt agreement implemented in 2014, Energy Northwest issues refunding bonds to extend the maturities of outstanding debt so that it more closely matches the lifespan of the facilities it finances, according to an investor presentation. Energy Northwest, a Washington State joint operating agency, owns and operates the Columbia Generating Station, the only commercial nuclear energy facility in the region. Project 3 is a nuclear electric generating facility in Satsop that was never fully built, shuttered in 1994, and later transferred to a coalition of local governments for remediation and economic development. Energy Northwest pays to maintain the site. The deal is led by senior manager JPMorgan.